body parts are green to olive brown. They have olive green to dull cinnamon under body parts, with one or more spots on the chest. The plumage of the blue-crowned motmot is composed of shades of blue and green. The center tail feathers are greenish blue, and have bare spines at the tip. Their legs are particularly short. The feet have a middle toe that is almost completely fused to the inner toe, but not to the rear toe. Blue-crowned motmots are 15 to 16 inches (38 to 41 centimeters) in length (including the tail) and weigh between 2.7 and 6.2 ounces (77 and 175 grams). The bill is about 1.6 inches (4.1 centimeters) in length. Geographic range: Blue-crowned motmots have the widest distribution of any motmots. They are found from northeastern Mexico to northern Argentina. Habitat: Blue-crowned motmots occupy a variety of habitats, including tropical evergreen and deciduous forests, coastal forests, mountainous forests, and secondary vegetation. They live on the edges of rainforest, secondary growth forests, and plantations. They range to altitudes up to 4,300 feet (1,300 meters), living near water for drinking and bathing. 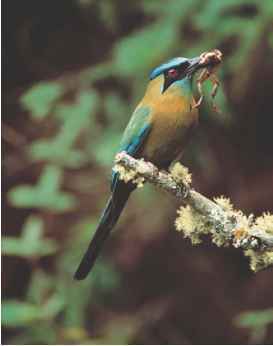 Diet: Blue-crowned motmots eats insects and other invertebrates, including earthworms, centipedes, and snails. They sometimes eat mice and small reptiles and amphibians, and occasionally some fruits. They capture prey by sitting quietly on wires, fence posts, or tree branches looking for prey. Sighting possible food, they suddenly fly toward the prospective meal, taking it while it flies or while on the ground. Before swallowing its prey, they hit it repeatedly against the ground or branches to kill or stun it. Insects are often eaten after trains of army ants disturb them. Fruits are often plucked while the birds hover in the air. Behavior and reproduction: Blue-crowned motmots can sometimes appear to be solitary birds, but in reality they maintain pair bonds. They are not very active and often go undetected. The tail often twitches like the pendulum of a clock when the motmot is disturbed. They make a sound like a double hoot with a resonance similar to that of an owl. They are inactive at night and active during twilight at both dawn and dusk, and most active at the early morning light. Pairs of blue-crowned motmots, who are believed to mate for life, dig holes during the rainy months from August to October when the soil is soft. The tunnel holes are 5 to 14 feet (1.5 to 4 meters) long and about 4 inches (10 centimeters) in diameter. The nest cavity usually measures 10 inches high (25 centimeters), 10 inches (25 centimeters) in width, and 14 inches (36 centimeters) in length. They are normally dug into the sides of cliffs or in the ground, but will use rock crevices on occasion. They reappear at the holes during the beginning of the breeding season, from March to April. After a courtship ritual involving the carrying of leaves by the male to the female, mating begins. One adult incubates the eggs from early afternoon to dawn, and then the partner takes its place. 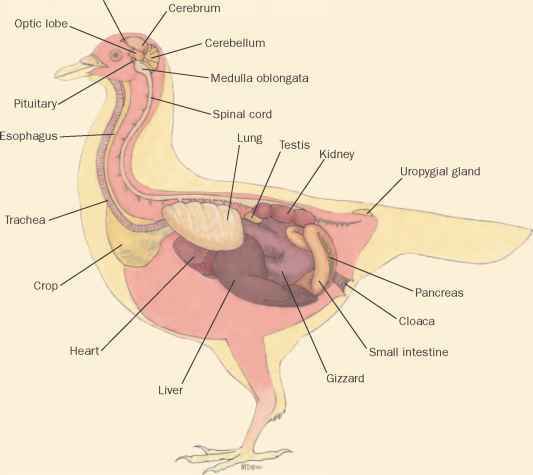 Incubation lasts about twenty-one days. Lowland motmots stop covering their young at night when they are a week old. Young resemble adults in coloration, but lack long racket-like tail feathers. Blue-crowned motmots and people: People have successfully bred blue-crowned motmots in captivity. Forshaw, Joseph, ed. Encyclopedia of Birds, 2nd ed. San Diego: Academic Press, 1998. "Blue-crowned Motmot (Momotus momota)." Coraciiformes Taxon Advisory Group, TAG website. http://www.coraciiformestag.com/ Motmot/history.htm (accessed on 20 March 2004).